Modern computers are becoming more tied to the cloud all the time. You can store information, write documents, listen to music, read email and even play video games in the cloud. There are a lot of advantages to this. You are able to access information from any computer, far less likely to lose it and can use local computers with far less power. Yet there are dangers as well. The most important of these dangers are security and privacy. One of the most important programs to keep safe is your Google Calender, which can have more information about your day to day life than anything else in the cloud. So, what privacy issues are there with Google Calendar, and how can you protect yourself? The most basic security question is how much information you share by default. In the case of Google Calendar you have three options. The first option is that you can make it private, so that only you can see it and is what Google Calendar is set to when you start. The second option allows you to choose certain people who are allowed to see your calendar. 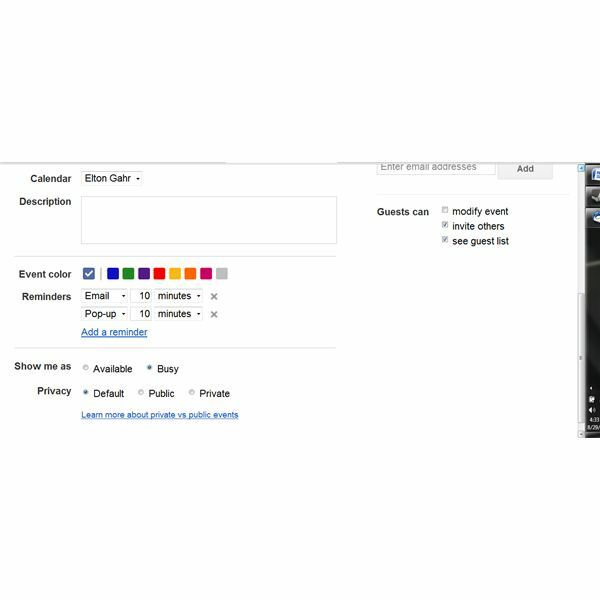 The third make the calendar public so that anyone can look at it and it will appear in certain Google search results. You can also set individual calendar posts with any of these settings. This means you could have a public calendar with some appointments set to private. In this way at least Google Calendar’s privacy is as good as you want it to be. That said, there are significant privacy questions when sharing the calender even with a few people. If you’re planning on having family come in from out of town you have just told everyone that their house is going to be empty and if they put that in their calendar it could become accidentally public. For this reason it is best to keep calendars at least limited to people you know unless there will never be any private or dangerous information in the calendar. A church or business calendar may only have events open to the public, and as such there is no danger to the calender being public. It is also worth noting that often when syncing calenders the settings may not be correct. This means that a three year old post in which you revealed a password or other piece of information may be made public inadvertently. To change these settings, go into Google calendars settings and find the specific calendar on which you want to change the settings. Under that tab you will find a share this calendar tab. 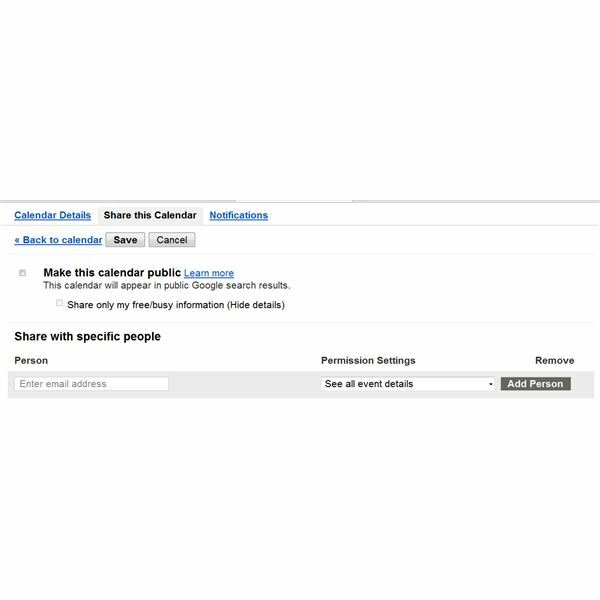 Going into this will let you set the default setting for sharing that calender. If you don’t want to share anything simply make sure none of the share options have a check mark. If you're not certain it's best to leave a calender private until you are certain. Even if you have your security settings set to complete privacy the calendar is still online. This means that you have to rely on Google’s security in order to protect that information. The good news is that Google has a lot more than any individual to lose if their security is breached, and so it is very unlikely that anyone is going to break Google’s security. However, anything online still can be hacked, so if there is information that must never be public it may be best to simply avoid putting it online at all, or at least keep it veiled. This makes the most likely gap in the security an EBKAC issue. That is an error between keyboard and chair. There are almost always spammers attempting to trick people into giving out passwords, including those in Google. This means you must be very careful giving your password to anyone even if they say they are Google. Even more likely to be a problem is a weakness in your password. It is vital that you have a strong password if you have any hopes of protecting the information in your calendar. This means a password that isn’t a word from the dictionary and includes numbers and likely symbols as well. It is also a good idea to have a separate password for each site you use since using the same password means that if someone hacks one site they have your password to another. One of the major Google Calendar privacy issues is syncing. This issue has been reported when people sync Outlook and Google calendars. You should be aware of this when syncing any calender to Google. The problem is that the default privacy settings set in Outlook do not always carry over to Google Calendars. If your Google Calender is entirely private this isn't a problem, but if it's public your appointments that were set to private in Outlook could be made public when synced. Since it is also possible to set syncing to automatic in some programs you need to be very careful what information is put into specific calenders and check what is public on occasion. It may seem that the information you keep Google Calendar is not vital information, but by allowing someone access to your calendar you can reveal far more information than you might think. It can tell someone when you are out of town, where you are going to be, who you are with and a lot a lot of other important pieces of information. In fact, shortly after Google Calendar came out a test was attempted in which the word “Password" was searched in Google Calendars and such information was found as a username and password for a credit report account at TransUnion. Many of these people were very technically proficient, but they failed to understand the dangers of the information that is in their calendars. That misunderstanding is perhaps the greatest of the privacy issues with Google Calender, because without an understanding of the dangers they do not know they need to address the problem. Anything that is put on the Internet has the potential of being hacked or accidentally revealed. All that any person or company can really do is limit those risks. Still, for the average person a good password and an understanding of the dangers should solve most of the privacy issues of Google Calendars. Beyond that it is simply a matter of fully understanding what the settings are and how much you want to share.